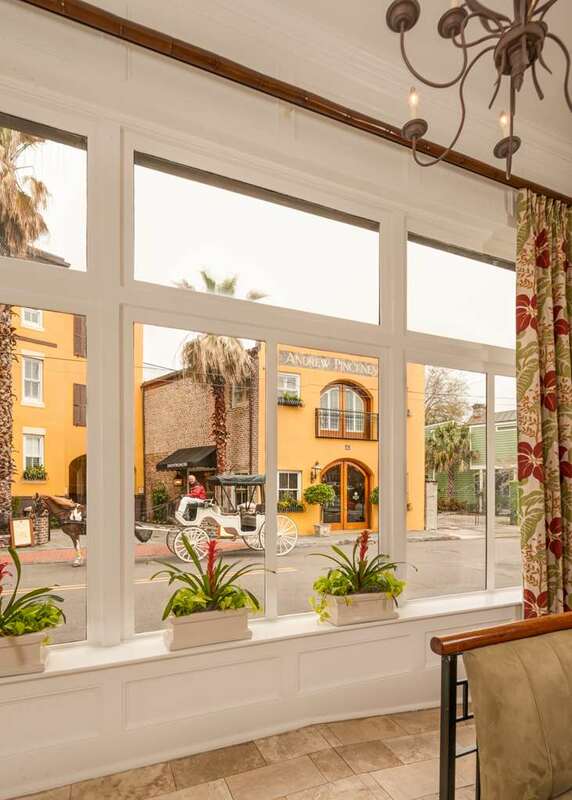 As a historic Charleston hotel The Andrew Pinckney Inn still provides the comforts of the modern day. The boutique hotel provides complimentary wireless internet access a state of the art business center luxury bath amenities valet laundry services and much more. Our Charleston hotel offers many different room types to guests. Each room has its own character which cannot be duplicated by chain hotels that one often sees on every street corner. Located in the historic district area near shopping and entertainment. Aiken Rhett HouseThe citys most intact antebellum urban complex -c. 1820-. Historic interiors surviving virtually unaltered since 1858 have been conserved and stabilized. Many family objects are still found in the rooms for which they were purchased. Boone HallA must see. - NBC Daytime Television. Boone Hall reflects Southern heritage spanning 300 years on one magnificent still working plantation. House tours gardens slave cabins plantation coach tours live performances in season cafe. Charles Towne Landing State Historic SiteBegin your Charleston experience where English settlers established the first permanent European colony in Carolina. This 664-acre historic treasure boasts a replica 17th-century tall ship functional cannons a zoo and an award-winning museum. Charleston Harbor - Water Front ParkThis park is an eight-acre linear park and pier along the Charleston Harbor entry. The park masterfully combines spectacular fountains spacious lawns intimate garden rooms walking and jogging path and a long pier with picnic tables and wooden swings. City Hall GalleryM-F 9am-5pm. Located in the Council Chamber of the Charleston City Hall -1801- the gallery contains portraits of many important leaders including one of George Washington by John Trumbull. Drayton HallThe oldest unrestored plantation house in America still open to the public. Admission includes guided House Tour Connections Program- From Africa to America interactive landscape tour African-American cemetery nature walks Museum Shop. Firefly DistillerySouth Carolinas first and largest distillery. Firefly Distillery is home to Firefly Sweet Tea Vodka the original sweet tea vodka and many more southern specialties. Guests are welcome Tue-Sat 11am-5pm for tastings closed January. Folly Beach Fishing PierThe Edwin S. Taylor Folly Beach Fishing Pier stretches 1045 feet into the Atlantic Ocean. The second longest on the east coast the pier offers not only great saltwater fishing and spectacular views but also tournaments special events and dining. Fort Sumter National MonumentOpen daily except New Years Day Thanksgiving Day and Christmas Day. Hours vary according to the season. Concessionaire ferries depart from Liberty Square in Charleston and from Patriots Point in Mt. Pleasant. Gibbes Museum of ArtExperience Charlestons history through art. Come face to face with stories of the South Carolina Lowcountry as seen through painting miniature portraiture sculpture photographs and more. Complimentary cell phone tour -using your own phone. Historic Market Old City MarketOpen M-Su. one of the nation's oldest public markets -circa 1804- this beloved attraction completed a three-year USD5.5 million renovation in June 2011. Shop for authentic Lowcountry souvenirs and hear the lilting dialect of Gullah ladies. MagnoliaOpen 365 days a year 8am-5.30pm call for Nov.-Feb. hours. This 17th century estate acquired in 1676 by the Drayton family features Americas oldest gardens -c.1680- which bloom year-round. Middleton PlantationA carefully preserved 18th century plantation National Historic Landmark and home of America's oldest landscaped Gardens. The House Museum highlights family collections and the Middletons' role in American history. Nathaniel Russel HouseGrand Federal townhouse completed in 1808. Restored interior w/ elaborate ornamentation and a magnificent free-flying staircase. Set amid spacious gardens and furnished with period antiques the house evokes the gracious lifestyle of the citys elite. Old Exchange and Provost DungeonBuilt by the British in 1771 American Patriots were held prisoner in the Provost during the War of Americas Independence. One of the three most historically significant buildings of colonial America. Educational tours/evening events. Patriots Point Naval and Maritime MuseumAt Patriots Point Naval and Maritime Museum tour the USS Yorktown USS Clamagore Medal of Honor Museum Cold War Submarine Memorial and the only Vietnam Support Base Camp in the U.S. Its history you can touch. St Philips Episcopal ChurchEst. 1670 St. Philips is the Mother Church of the Province and originally stood on the site where St. Michaels stands today. The second structure at the present site was completed in 1724 but destroyed by fire in 1835. The Citadel MuseumSu-F 2-5pm Sa 12-5pm. Closed College religious and military holidays. Museum portrays the history of The Military College of South Carolina and Corps of Cadets from 1842 to present. Exhibits feature photographs uniforms and archival documents. College of CharlestonFounded in 1770 the first municipal college in America was built in 1724 on land set aside for educational purposes. The present main building was designed by eminent Philadelphia architect William Strickland built in 1828. Kiawah Beachwalker ParkLocated on beautiful Kiawah Island Beachwalker Park offers the islands only public beach access including ocean frontage and a river view. Lifeguards on duty seasonally. Dogs must be leashed at all times. Operating hours vary seasonally.